Lost the manual for your HT or Mobile rig? Did you purchase a used radio and it did not come with a manual? 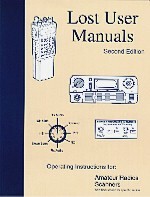 Do you have the manual but still can't work the radio quickly? "LOST USERS MANUALS" contains operating instructions for all the popular amateur radios and scanners. Copyright ©1995,96,97,98 artsci inc. all right reserved.